The flu pandemic continues to be a hot topic with devastating economic impacts according to Reuters. When I was stricken recently, I benefited from paid sick time during the several days I was too sick to work and telecommuting as I recovered. For many workers, though, there is no paid sick time. In the US, there are no federal legal requirements for paid sick time, though many employers offer this benefit to be competitive in the market for workers. Our recent 2013 Sick at Work survey showed that the majority of hourly employees – 53 percent – are not paid when they are out sick. It’s interesting, though, that the issue of losing wages isn’t the top factor people considered when making the decision about staying home. According to the survey, when faced with the decision of whether to stay home or go to work when they are sick, the top 3 factors that hourly employees considered were: 1. 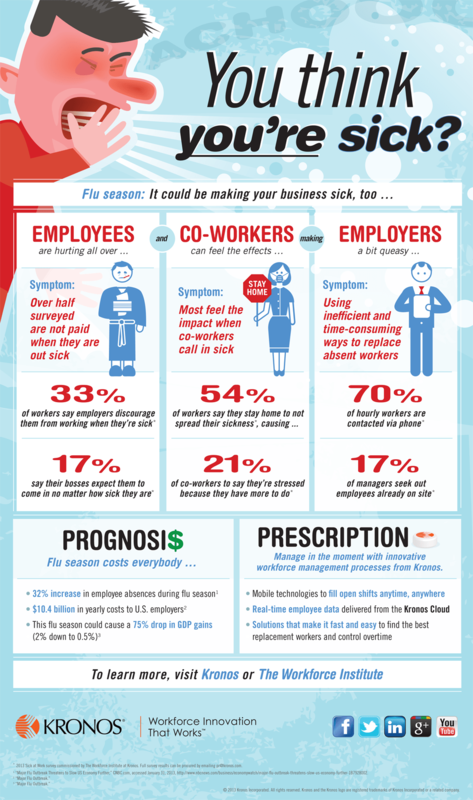 “I don’t want to pass my sickness onto my co-workers” (54 percent); 2. “My health comes first – I stay home when I am sick” (49 percent); and “If I don’t report to work, I don’t get paid” (39 percent). Assuming everybody’s being forthright on the survey, it’s encouraging to think that the golden rule is trumping personal financial sacrifices associated with lost wages. In a perfect world, though, people wouldn’t have to make the tough choice between getting paid and doing the right thing for their health and that of their coworkers. Check out this McGill study on paid leave and other family friend practices worldwide. You may be surprised where the US ranks. Check out this cool inFLUgraphic as well. It highlights our survey findings and provides other helpful information about managing absenteeism. You may also want to check out The Kronos Resource Guide: Flu Related Workforce Management Issues . Previous Previous post: Thank You, Storm Heroes!